The Alcone Sub 20 is a perfect addition to Alcone Lagrange XT or other satellite systems. Dimensions are 85 x 35 x 45 cm (HxWxD) containing two Alcone AC 10 HE with aluminium cone and a Audaphon AMP-24 amplifier with an output of 2x 90 Watts into 4 Ohm. The larger membrane area of the Sub 20 produces considerably more oomph than the Sub 10. Frequency response is from 27 Hz (-8 dB) respectively 29 Hz (-3 dB). Since both bass drivers are connected in parallel the resulting total impedance of 4 Ohm enables the amplifier to develop its full power. That's it! 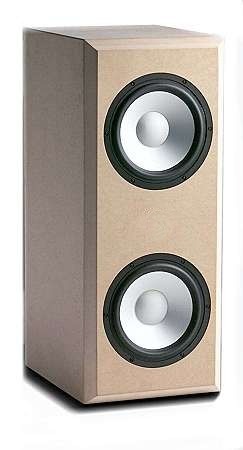 Should you want to release your speakers of the duty to produce low bass - that's were a subwoofer is at its best - then they should be connected to the terminals. 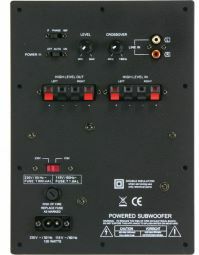 Otherwise, there are 5 different, additional ways, to connect your amplifier to the module. Please contact us if you need help.